Welcome to the website of Fitness Network! We are starting a New Class in January 2018 to teach Wu Hu Qin Yang Spear. Please click here for our updated class schedule. Please click here for our updated class schedule. For private, customised lessons, please contact Ms Evelyn Lee 96186886. In celebration of Chinese New Year, there will be NO Class from Sunday, 7th February 2016, to Wednesday, 10th February 2016. Classes will resume from Friday, 12th February 2016. Wishing All a Happy, Healthy, Peaceful & Prosperous Year of the Monkey!!! We are starting New Classes in January 2016. For the first time, we'll be having a class teaching Wing Chun Kuen. Please click here for our updated class schedule. Due to SG50 National Day celebrations, there will be NO Class on Friday (7th August), Sunday (9th August) and Monday (10th August), but classes are as usual on Saturday (8th August). 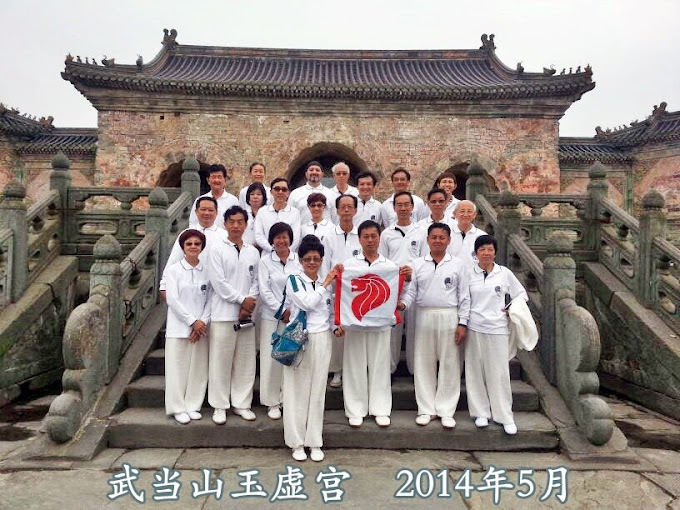 In May 2014, a group of students led by Master Xia Minghua and Ms Evelyn Lee went on a one week study trip at the "Wudang Daoist Traditional Kung Fu Academy". Click here for article in Chinese at the Acadamy's website. 2014-01-22: Fitness Network Graduation & Farewell Dinner for Master Xia Minghua. Master Xia Minghua will be teaching in Singapore till the end of February. We will be holding a combined graduation and farewell dinner on 22nd February 2014 (Saturday), 7:00pm at the Republic of Singapore Yacht Club (RSYC), Quarter Deck. There will be performances by students as well as demonstrations by Master Zhou Yuewen, who will be teaching some of our new classes starting in March. Students (including former students) who want to attend the dinner should contact Evelyn before 8th February. For directions to RSYC, please click here. Please note that there will be NO Class on Friday (31st January 2014) and Saturday (1st February 2014), Chinese New Year holidays. Classes will resume from Sunday (2nd February 2014). Wishing All a Happy, Healthy, Peaceful & Prosperous Year of the Horse!!! Please note that there will be NO Class on Wednesday (25th December 2013), Christmas, and Wednesday (1st January 2014), New Year's Day public holidays. We are starting a New Class on 3rd November to teach Daojia Yangsheng Taiji Quan. The class will be taught by Master Xia Minghua and held at Bras Basah Complex, 5th floor open space, every Sunday, 7:30 - 9:00pm. To view a video clip of Daojia Yangsheng Taiji Quan, click here. Please note that there will be NO Class on Saturday (2nd November), Deepavali public holiday. Please note that there will be NO Class on Friday (29th March), Good Friday public holiday. Please note that there will be NO Class on Friday (26th October), Hari Raya Haji public holiday. Please note that Classes are as usual on Saturday (5th May), Vesak Day public holiday. Please note that there will be NO Class on Sunday (1 May), but Classes are as usual on Monday (2 May) and Saturday (7 May).